Rory McIlroy shot successive birdies in his final two holes to move within two shots of leader Billy Horschel after the Tour Championship second round. The Northern Irish world number one, 25, carded a five under 65 at East Lake Golf Club in Atlanta to move into a three-way tie for second with Jason Day and Chris Kirk on six under. 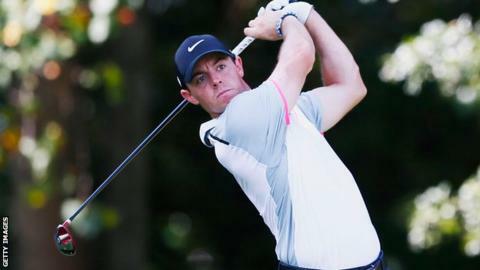 Victory for McIlroy would also secure the overall £6m FedEx Cup title. Horschel, from the United States, carded a 66 to move to eight under. Horschel, winner of the BMW Championship last week, can also claim the FedEx Cup title on Sunday with victory. McIlroy's round included six birdies and just one bogey, as well as a bizarre moment on the 14th hole when a wayward drive clipped a tree and dropped into a spectator's shorts pocket. "I got really lucky," said McIlroy. "It ricocheted off a tree and went straight into his pocket somehow. "That ball could have gone anywhere and luckily I was able to take a drop and hit it on the green and make par. "The guy probably deserved more than just the handshake that I gave him." England's Justin Rose trails Horschel by six shots after carding five birdies and one bogey in a round of 66 to move into a share of 10th, two under overall. The Tour Championship is the last in the four FedEx Cup play-off events with a field of just 29 having been whittled down from 125 since Hunter Mahan won the opening event. In theory, anyone left in the field can win the season-long title with victory at the Tour Championship but those outside the top five in the standings will have to rely on other results.